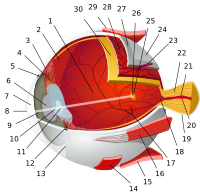 Bruch's membrane is the innermost layer of the choroid. It is also called the vitreous lamina, because of its glassy microscopic appearance. It is 2–4 μm thick. The retinal pigment epithelium transports metabolic waste from the photoreceptors across Bruch's membrane to the choroid. Bruch's membrane is present by midterm in fetal development as an elastic sheet. Bruch's membrane thickens with age, slowing the transport of metabolites. This may lead to the formation of drusen in age-related macular degeneration. There is also a buildup of deposits (Basal Linear Deposits or BLinD and Basal Lamellar Deposits BLamD) on and within the membrane, primarily consisting of phospholipids. The accumulation of lipids appears to be greater in the central fundus than in the periphery. This build up seems to fragment the membrane into a lamellar structure more like puff-pastry than a barrier. Inflammatory and neovascular mediators can then invite choroidal vessels to grow into and beyond the fragmented membrane. This neovascular membrane destroys the architecture of the outer retina and leads to sudden loss of central vision - wet age related macular degeneration. Pseudoxanthoma elasticum, myopia and trauma can also cause defects in Bruch's membrane which may lead to choroidal neovascularization. Alport's Syndrome, a genetic disorder affecting the alpha(IV) collagen chains, can also lead to defects in the Bruch membrane such as 'dot and fleck' retinopathy. Bruch's membrane was named after the German anatomist Karl Wilhelm Ludwig Bruch. ^ a b Lee, Christina J.; Vroom, Jonathan A.; Fishman, Harvey A.; Bent, Stacey F. (Mar 2006). "Determination of human lens capsule permeability and its feasibility as a replacement for Bruch's membrane". Biomaterials. 27 (8): 1670–1678. doi:10.1016/j.biomaterials.2005.09.008. PMID 16199085. ^ Young R (Mar 1987). "Pathophysiology of age-related macular degeneration". Surv Ophthalmol. 31 (5): 291–306. doi:10.1016/0039-6257(87)90115-9. PMID 3299827. This page was last edited on 17 April 2018, at 16:42 (UTC).